The call for applications for the “International Award UCLG – Mexico City – Culture 21”, will stay open from 2 November 2017 to 16 March 2018. This Award aims to recognise important contributions from cities and individuals to the relation between culture and sustainable development. All Cities and Local Governments who work on culture and sustainability and who implement projects, programmes, and policies in this field are invited to send a candidacy. The objective of the International Award is to recognise leading cities and individuals that have distinguished themselves through their contribution to culture as a key dimension in sustainable cities. 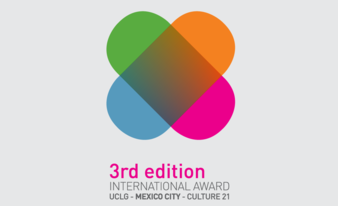 The International Award ‘UCLG – Mexico City – Culture 21’ has two categories: the City/Local or Regional Government Award and the Individual Award. The first one recognises a city, local or regional government the cultural policy of which has contributed significantly to linking the values of culture (heritage, diversity, creativity and transmission of knowledge) with democratic governance, citizen participation and sustainable development. The second one recognises an internationally renowned individual who has made a funda­mental contribution to the relationship between culture and sustainable development.